Date Added: Tuesday 06 August, 2013 by Colin V.
I had contacted Indy with this coat in mind, but it really turned into a bespoke build quite quickly. I went for the black cowhide. If you're questioning the leather quality, don't. It's beautiful. If you're wondering about the construction quality- don't- it looks and feels very plush and I couldn't even see a single pucker in the lining of the coat. Over all, I was very happy with the product. I asked for a custom collar, requested buttons, 2 outer and 3 inner pockets, no rear vent. I wanted to forego the belt but still maintain the shape the belt gives as well as having structure to the shoulders so they fall sheerly at the edges. the pockets even have leather surrounds on the lip, one with a zip also. Indy obliged wonderfully with all these potentially difficult request and delivered a coat of the exact shape I wanted, glove like fit, wonderful quality and with the weight to the leather that you really need when wearing a longer coat in my opinion. it moves under it's own mass- it's not fly away like lighter lamb skins I've experienced in the past. Indy obviously paid close attention to my photo sources and amateur sketches of my design requirements. He also called me on a few potentially conflicting measurements right at the start of the process. I got the full package and would recommend to anyone! Top notch & thank you :).. Date Added: Monday 05 February, 2007 by Colin D.
I just got my custom made Blade coat and it is just superb. I have been waiting to get a genuine leather coat like this for several years and it has certainly been worth waiting for. It looks fantastic and the fit was excellent. Mr Magnoli has certainly won my confidence and I am already thinking of getting some accessories like trousers and under vest. Another bonus about the Daywalker coat is that it has the style of 'The Matrix.' 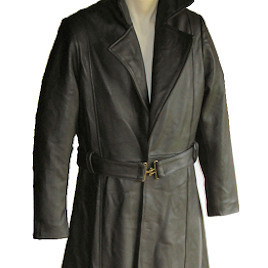 I like having the 'Morpheus' feel of having a long black leather trenchcoat. I am very pleased with this product that I just felt I had to write a review. Thanks Mr Magnoli!..